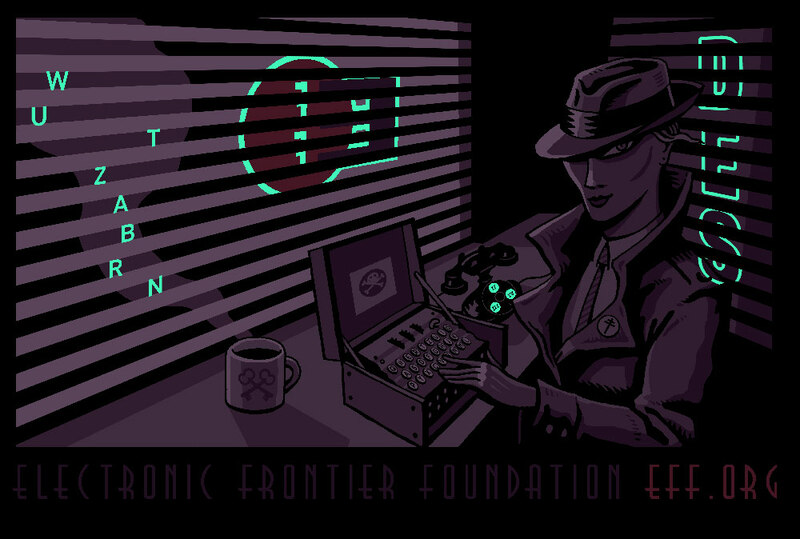 This summer EFF unveiled the sixth limited edition member's t-shirt for the 23rd annual DEF CON, the premier world hacker conference in Las Vegas. 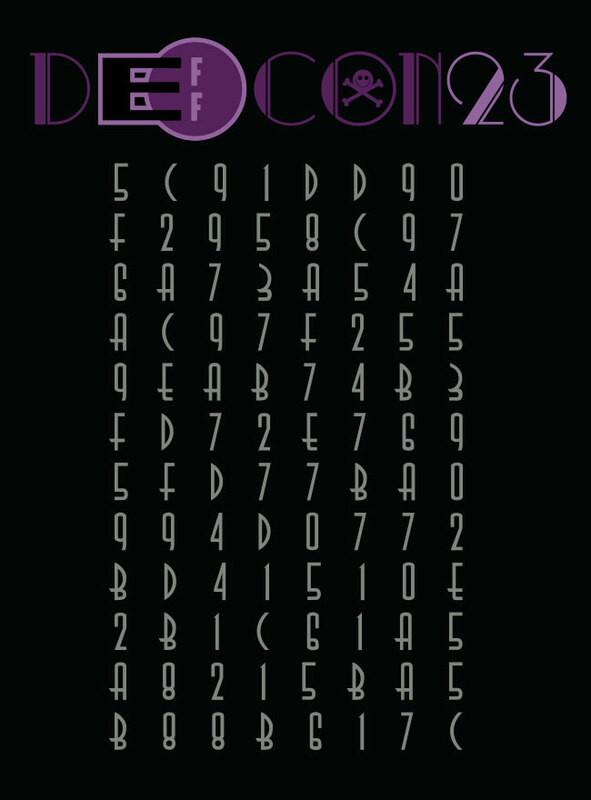 This year’s design, like the shirts we produced in 2013 and 2014, includes a puzzle that involves the use of encryption. In keeping with DEF CON's “film noir” theme for this year, the back of the shirt features an illustration of a fatale-istic detective surrounded by clues. Unpack the clues correctly, and you can decode the cipher text to uncover a secret message! The glow also reveals another cipher text, (WUTZABRN), floating in the steam emerging from a coffee cup marked with a key. The “DES” on the wall was also a clue for the front cipher text, which decrypted (using the key in Electronic Codebook mode) and the “BACKDOOR" key to “Join the resistance. VHTWCMZTYOGZIJRDAUB.” Running this new cipher text back through the Enigma yielded “ENCRYPTALLTHETHINGS” — Encrypt all the things. Congratulations to our three winners CryptoK, pseudoku, Elegin who successfully solved the puzzle with only minutes left of the conference! Notably, they found that if you swap rotor 2 and 3 in our puzzle you get ISRTPNHW which is an anagram for PWNSHIRT. 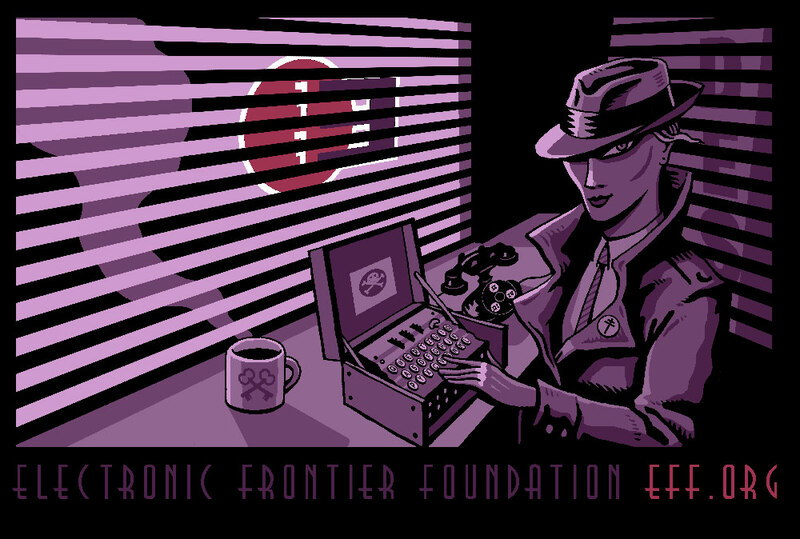 This seasoned team also solved EFF's 2013 shirt, and won the DEF CON badge challenge for three consecutive years. Nothing brings people together quite like encryption and digital freedom. Join the resistance—encrypt all the things.